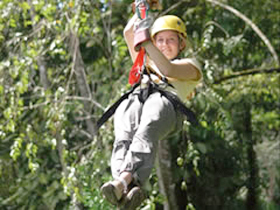 Travel through the primary Costa Rican tropical jungle on suspension cables as you move through the primary jungle canopy with your bilingual guides and safety spotters from platform to platform. If our high-tech, high-quality equipment for zip-lining turns out to be “not your style”, then relax and enjoy a cold one back on the ground as you watch your fellow guests sip line by line to each canopy platform. If you so desire, take a leisurely stroll or hike through the secluded, protected habitat of the mono titi biological corridor, which is an excellent location for you to explore the exotic varieties of plant and animal life in the Costa Rican mountainous jungles near Manuel Antonio National Park. If you so desire, spend half your day on zip lines, then relax and be gently guided by well-educated, bilingual naturalists as they take you on a leisurely hike to explore and discover the diverse tropical rain forest that Costa Ricans try so desperately to preserve. Must be at least 6 years old and have an adventurous spirit, wear comfortable yet casual clothing that you can move around comfortably.